II Naochika was a samurai in the 16th century. He was a son of Ii Naomitsu, father of Ii Naomasa and heir of the Ii clan. His father Naochika was murdered for he was thought to have betrayed the Imagawas. Then he escaped to Shinano, current Nagano and spent most of his teenage days there. 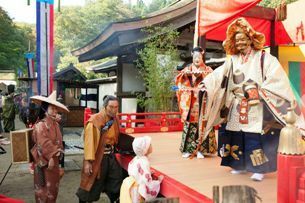 After returning to Totomi province, he married a daughter of OKUMAMA Tomotoshi, vassal of the Iis. He was originally engaged to Ii Naotora, heiress of the clan but she became a priest after his escape. He took over the head of the Iis after the death of his cousin Ii Naomori in the Battle of Okehazama. 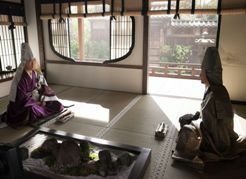 However, order of the province was disturbed at that time and he was rumoured that he was secretly connected with MATSUDAIRA Motoyasu, later TOKUGAWA Ieyasu. He visited Sunpu to vindicate himself but was killed on his way. 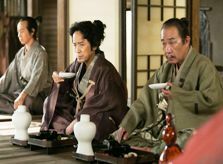 In this drama, he is called Kamenojo in his childhood and Naotora and Tsurumaru, later ONO Masatsugu are childhood friends. 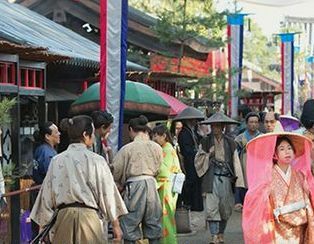 At first he hopes to marry Naotora who is a priest but marries Shino, daughter of Okuyama Tomotoshi. Though Naotora still loves him and his death gives her a supportive push forward. Then she becomes a chatelaine and brings up his son Naomasa. Both Naomori and Chika are surprised at the behaviour of their daughter. O-Towa tells Ono Izuminokami that Tsurumaru deplores that he actually murdered Ii Naomitsu and breaks off the engagement. Besides, IMAGAWA Yoshimoto writes to Naomori that he must submit her as hostage to the Imagawas and she must not be a priest. O-Towa eavedrops the demand of Yoshimoto and asks Nankei what to do, but he says that her way of breaking off an engagement is wrong. And he tells Naomori and Chika that Yoshimoto doesn't permit O-Towa become a priest but is unsatisfied with disobedience of the Iis. He plans to ask TAIGEN Sessai, a priest who serves the Imagawas to use his good offices. Sessai is his senior in Rinzai school of Zen Buddhism. O-Towa(Miu Arai, centre) enjoys sarugaku. O-Towa, her nurse Take, her uncle NIINO Samanosuke and some followers depart for Sunpu, capital of Suruga. There she exults at various goods and food in the shops and sarugaku, a kind of theatre. Then they enter the residence of SEKIGUCHI Chikanaga, husband of Sana who is a daughter of Naohira and younger sister of Nankei. O-Towa sees a kemari (*) ball on a corridor and a girl who is searching it. She introduces herself to the girl who is called Sena. Sana appears then and O-Towa greets her. On the other hand she wonders why very few people mention her. 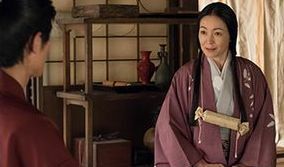 Take says that in the past, she became to serve Yoshimoto and experienced "Otetsuki" many times and was forgotten, and married Sekiguchi Chikanaga, one of his vassals at last. O-Towa says it must no be. Meanwhile Nankei meets Sessai and asks him to settle the matter of O-Towa as he thinks fit. Sessai tells him that there's still the possibility that she is made to stay in Sunpu. In the residence of Chikanaga, O-Towa is told to hand a letter to Sana by Nankei. It is one of his plans but she tears it and blames her brother. Though all of his plans break down, Nankei quibbles to justify himself. At the same time, Tsutumaru is kidnapped by Naohira in retaliation to O-Towa's visit to Sunpu as hostage. 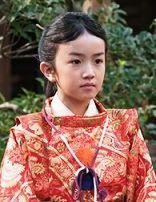 Naomori tries to stop the hip-shooting of his grandfather who regards Izuminokami as the enemy of the Iis. While Tsurumaru keeps calm, Naohira daringly denounces his father . On the following day, O-Towa, Take, Samanosuke and Nankei arrive at the residence of Yoshimoto but only O-Towa and Take are allowed to enter, led by Izuminokami. Soon after that they are informed the kidnap of Tsutumaru and O-Towa feels responsible for it. She meets Jukeini, mother of Yoshimoto who finishes reading a letter from Sana. JUkeini suggests the girl see kemari Tatsuomaru (later Ujizane), son of Yoshimoto joins. Those who beat him in the game are rewarded. She offers him a competition of keeping the ball in the air as long as possible. Though Tatsuomaru is good at it, O-Towa, who is unfamiliar to the game often fails but wins her rival at last. Then Yoshimoto appears and she insists on being rewarded. Finally she is permitted to return to Ii-no-ya by Yoshimoto as reward. The Iis' fief is recognised and negotiated in exchange of O-Towa's becoming of a priest. 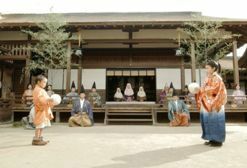 (*) Kemari is a ball game that was popular among noblemen in Kyoto and some influential daimyos. This game is played by four, six or eight people and its object is keep the ball in the air. (**) The word otetsuki means touch or touching. O-Towa, who is 10-year-old regards it as something like "tag" in children's game and thinks being tagged by many children is uncomfortable. But it also means the act of a nobleman having a sexual relationship with his maidservant. Anyway it's hard for Take to make her young lady understand it. HOTTA Sakubei Okishige was a samurai from the 16th century to the 17th century. His younger sister is a concubine of SANADA Nobushige. Though the first half is his life is unknown, he served SANADA Nobuyuki after the second Siege of Ueda in 1600. And he adopted Sue, daughter of his sister as his daughter and made her marry an owner of Honjin (inn for daimyo) in Chiisagata, Shinano where Nobuyuki ruled. After that, he went to Osaka to serve SANADA Nobushige (Yukimura) in the Siege of Osaka and failed in battle in May, 1615. In this drama, he is described as a common soldier who serves the Sanadas but is a farmer in peacetime. And he adopts his niece Sue after the death of his younger sister Ume in the first Siege of Ueda. When the Siege of Osaka becomes unavoidable, he declines the advice of Nobuyuki and goes to Osaka to join Nobushige. 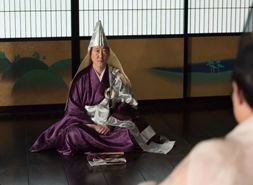 The image shows Takahiro Fujimoto as Hotta Sskubei.